Never mind the Easter bonnets. In a large swath of the U.S., you had better remember where you put your winter hat and put it on. Frost and freeze warnings are in effect for the next few nights throughout much of the Southeast, while the snow continues to pile up across portions of the Great Lakes and the Northeast, which has seen more snow so far this April than what fell over the entire month of December. The cold weather, says CBS News meteorologist George Cullen, is the result of an intense storm system sweeping down extremely cold air from central Canada on down to the eastern half of the U.S. The flakes fell at a rate of up to 2 inches per hour, and by early Thursday, areas of Maine already had nearly a foot and a half of wet, heavy snow, and central New Hampshire saw 16 inches in spots. Up to 24 inches fell in Michigan's Upper Peninsula, as many as 13 inches in Vermont, and upstate New York had several inches as well. In Kansas, five to eight inches of snow is on the ground in the east-central and north-central parts of the state, and with temperatures expected to dip into the lower 20s and teens in the next few days, farmers are worried about their crops. The cold snap came after two weeks of exceptionally warm weather, with highs around Kansas of from 60 to 80 degrees, speeding up the growth of the wheat by about two weeks. "I'm concerned," says Saline County wheat farmer Gary Olson. "Usually if it gets below 24 degrees, the experts tell us our wheat crop might be in trouble." "We're pretty vulnerable," says Tom Maxwell, agricultural extension agent in Salina. If the weatherman's right, he adds, "we're going to see some damage." In Nebraska, it's also cold and snowy, but some locals are unimpressed, pointing out that snow in early April is far from unprecedented in the Plains. In Arkansas, snow is not an issue, but the cold is – with freeze warnings in effect and record lows expected over the weekend. Things will also be a lot nippier than usual in Augusta, Ga., home of the Masters golf tournament, already underway. It will be one of the coldest Masters ever, says Cullen, with temperatures struggling to get out of the 50s. "Usually the temperatures are not lower than the scores; this year, they will be." In many areas of the country, spring snow and shivers are following a winter that was often unusually warm. "We had Easter on December 25th. People had crocuses coming out and blooms on bushes. And now we have Christmas, with all this snow," said meteorologist Butch Roberts of the National Weather Service in Gray, Maine. "It's a little topsy-turvy sometimes." Maine baseball fans shared in the misery as the Portland Sea Dogs season opener was postponed for at least a day, but the team made the best of it, dotting the field with 11 snowmen in jerseys and caps - nine players, a batter and an ump. It was the second time since 1994 that opening day was delayed by late snow. In Manchester, the New Hampshire Fisher Cats canceled Thursday night's home opener but put out the call for fans to help clear the turf for a Friday game. Volunteers who show up with shovels get free tickets. The 24 inches that fell in Negaunee Township, Mich. broke a 1974 record of 12 inches, said meteorologist Jason Alumbaugh. The cold weather forced postponement of Thursday's baseball game at Comerica Park between the Toronto Blue Jays and the Detroit Tigers. Snowfall in April is not unusual, but the volume of snow in this storm is relatively rare. The 11.6 inches on the ground in Portland, Maine, tied a record for its fifth-biggest April snowfall. Jon Blanchard, spending his first night back in Portland after a winter in Florida, was awakened Thursday by the sound of tree limbs snapping under the weight of the heavy snow. He put aside plans of unloading his camper and fired up his snow blower instead. "I hate it," Blanchard said. "That's why I spent the whole winter in Florida." The weighed-down trees and limbs also felled power lines. About 100,000 homes and businesses lost power in Maine, in and around Alfred, Brunswick and Portland; another 81,000 customers were in the dark in New Hampshire, and Vermont had about 1,300 outages. 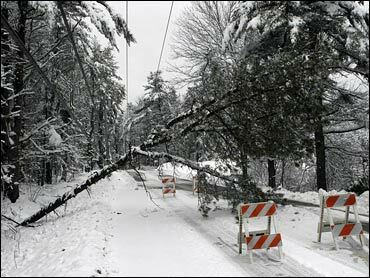 Outages could continue as snow melts and more trees fall, utilities said, and a spokesman in Maine said many customers there would be in the dark into Friday. The heavy, wet snow clogged roads early Thursday, prompting school officials to cancel or delay classes around the region. The Red Cross had to cancel several blood drives in northern New England, and issued a plea for donations. A man was killed in New Hampshire when his car ran off Interstate 93 and hit a tree during the storm Wednesday night on the Canterbury-Concord line, state police said. A tractor-trailer carrying oxygen bottles skidded and rolled over Wednesday night on the Everett Turnpike in Merrimack. Bottles rolled out, and it took crews all night to clear the road, though none of the bottles broke. The driver was hospitalized with non-life-threatening injuries. Cars were also reported off the road in Maine, and police said a 17-year-old girl's death Wednesday on a slippery road in Topsham may have been weather-related. At ski areas, the snow was a welcome lift. "It's going to help us close the season strong," said Chris Lenois, a spokesman for Vermont's Mount Snow, which ends its season on Sunday. About 6 inches fell in West Dover.